Even though it’s been a rough few weeks, I’ve still been working on Keeper Keeper. I kept running into problems, life got busy, and I had to rethink a lot of stuff with the game. Before I knew it, I had lost a month and still hadn’t updated this devlog. Now that I’m back, let’s get to it. So, how’d I do this (past few, god dammit) weeks? Ugh. Ok, admittedly not awesome. Aside from not actually making the time to update this devlog, I started working on and actually finished a couple things in the game that I decided to cut, plus I found myself refactoring a lot of my code to support these short-lived features. Some of that is bad planning on my part (I should’ve prioritized gameplay over UI), while other parts simply had to be tried out. At any rate, I learned a lot, and that’s the biggest thing I care about right now. 8-way movement and why it had to go. I got this working pretty soon after the last devlog, and almost immediately cut it. Once it was implemented I decided I didn’t like the feel of it at all: it was too jerky and didn’t feel good with Unity’s physics system. If you had the ball and turned, your player object would bounce and snap to the restricted angle, hitting the ball and sending it off in unpredictable directions. When I applied smoothing to it, things didn’t feel any better. Since this game does use a physics system, forcing things into a more restricted setup simply wasn’t good. Note to self: if you’re gonna use physics, go all in and be analog all the way. Of course, now this means I’ll need to find joysticks that offer 360 degree inputs. This was the bulk of my problems. I did end up refactoring (again) to support a pause screen that could stop the physics while allowing the player to select items in the menu, then when it was almost done I realized that an arcade game doesn’t need the ability to pause. Cool. I got the whole thing working, which meant making art and refactoring a lot of my code (adding a better state machine to turn physics on and off, and redoing the inputs [hey, good news here, now I’m using Rewired so you can use whatever controller you want, I hope]), and then cut it. It’s gone, you could pause the game, now you can’t. I don’t consider all this a waste, but it did burn a ton of time and wasn’t exactly a fun thing to work on. 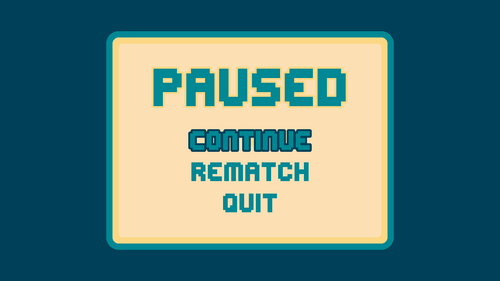 My big learn here was that even if I did intend on having a pause screen, I should’ve made it later in development. There are still so many gameplay elements to be worked out (and, who know, maybe scrapped) that I should’ve been focused on, but oh well. Fail faster and all that. New stuff that’s still in the game! Rewired! I changed from my custom input system to Rewired because I want support for different kinds of controllers, not just a PS4 controller on a Mac. I haven’t tested other setups, but it should be generic enough to work for most people regardless of controller or OS. Windows! Now you can play on Windows, yay! This wasn’t available before cause I hadn’t installed the Windows build tools (I had reasons, but they don’t matter anymore #praisebe), but now it should be good to go. Get that .exe and get at me if it’s weird. A new devlog. I still mean to update this every week, and now that things are setting down and I’ve gotten past this pause screen rut it’ll be easier to follow through with updating this every week. Aside from that, I’ll be working on the new keep interactions. That’s the core of the game and will be my focus. I’ve already got pushing keeps around, and I’ll be adding keep on/off toggle buttons and keep capturing mechanics. I’m pretty excited to try these out, and if they work it should be a good time! Ability to win and reset the game. Player abilities (grab and shoot). Complete animations for keeps, players, the ball, and UI. Main menu, including settings and controls overview. Game mode, player, and arena select. Offensive goal based mess em up sportsball game!